Copyright: © 2016 Rudi AM, et al. This is an open-access article distributed under the terms of the Creative Commons Attribution License, which permits unrestricted use, distribution, and reproduction in any medium, provided the original author and source are credited. This study investigates geochemistary of major and trace elements of sandstones and mudstones in the Chabahar area located of northeastern Oman Sea. In this study, 52 samples were taken from 5 sections included of Tiss, Ramin, Lipar, Gorankash and Garindar estuary. Then have been done grain size and chemical analysis using XRF and ICP AES methods in geological survey of Iran. Comparison of major elements values with the average amounts of upper continental crust indicate due to sedimentation processes or the lack of source rocks contain sodium plagioclase, the amount of Na2O and Fe2O3 in continental crust is highly depleted. Plotted geochemical data of major elements from Late Miocene-Pleistocene, age 10 mudstone and sandstone samples in east coasts of Chabahar in Makran zone, on siliciclastic rocks classification diagrams, showed that the sandstones are genus wackstone, Mudstones and shale. Values range the chemical index of alteration (CIA) and plagioclase index of alteration (PIA) respectively is from 40 to 60 and 40 to 64. However, most samples have values less than 50, suggesting a low to moderate degree of alteration (weathering) and arid to semi-arid climate during deposition in the source area. Major elements geochemistry is not useful for interpreting the tectonic setting. Discrimination plots based on assotiated trace elements, such as Ti, Zr, La, Sc and Th, show that most data located in the active continental margin field and tectonic setting have developed in active continental margin (ACM). Finally, geochemical data and using from sediments silisiclastic discriminate diagrams on the major elements in these rocks shows that the quartzose sedimentary provenance. The chemical and mineralogical composition of clastic sedimentary rocks is controlled by various factors such as source rock composition, chemical and physical weathering and sedimantition processes such as mechanical sorting decomposition and diagenesis [1-4]. It is on this basic, therefore, that the chemistry of fine-grained clastic sedimentary rocks has been long utilized for making inference on source rock compositions, palaeoclimatic conditions and tectonic setting . The relationship between the composition of siliciclastic sediments and their tectonic setting and provenance has been examined by many workers [6-12]. The geochemistry of siliciclastic sedimentary rocks may reflect the signature of parent materials [5,13], and literature provides many examples of ways to interpret geochemical data to understand sedimentary rock provenance [9,11,14-18]. Because chemical composition is also a function of weathering, transportation, and diagenesis, much emphasis has been put on relatively immobile elements such as Cr, Co, Th, Y, Zr, Hf, Nb and Sc. The low mobility of these elements during sedimentary processes enables a better discrimination of the provenance and tectonic setting [5,10,13,19,20]. Along the Makran coastline, the formation of the coastal escapments and fluid migration has been attributed to repeated pulses of vertical movments [21-24]. Although tectonic events interrupted the formation of complete sedimentary cycles in the shelf and shoreline exposed in these escapments, the effects of these tectonic movments did not uniformly influence the sedimentary records along the coastline . Geologic studies have concentrated on the Quaternary rocks exposed in southeast Iran, as well as in the Oman Sea. In contrast, little is known about the Cenozoic rocks in Chabahar. In general, the papers published on the Quaternaryrocks of Chabahar deal mainly with their sequence stratigraphy and sedimentology. No detailed studies of their geochemistry and tectonic setting have been made. The present work incorporates geochemical composition of the Quaternarysandstone and mudstone exposed southeast of Chabahar area, in an effort to disclose their provenance and tectonic setting. An attempt is also made to depict the paleo-weathering conditions of the source area during their deposition. The Makran accretionary prism results from active subduction of the Arabian plate beneath the Iranian and Afghan continental blocks since the Late Cretaceous times [25-27]. The plate convergence rate has been estimated between 2.5 and 4 cm yr−1 [22,26,28,29]. The Makran subduction zone is an area of significant seismic activity [30-33], periodically affected by devastating earthquakes such as the 1945 Makran earthquake (Mw 8.1–8.3), which is the largest known in this region [21,31,34,35]. Low- to moderate-magnitude earthquakes (mainly related to thrust activity) occur more frequently (b50 y return time) in the Makran area (not restricted to the coast) [30,31]. The pattern of seismicity is distributed over a 700 km long and 200 km wide segment of plate boundary [31,32]. The Makran accretionary prism is more than 350 km wide . Over 60% of the prism is presently sub-aerial, separated from the submarine part (100–150 km) by a nearly undeformed continental shelf . As subduction proceeded, from Paleocene time, the oceanic depo-trough shifted episodicslly southward; with each shift a thrust slice of the sedimentary prism accreted onto the northern continental blocks. The differing rate of emergence along the coastline resulted in the formation of marine terraces of different heights [21,24]. The studied sediments are exposed east Gulf of Chabahar, along 25 km of the Makran coast of the Oman Sea (Figure 1). This coastline defines the southern boundary of the Coastal Makran Zone of . The Miocene-Pleistocene sediments (Geological Survey of Iran, 1996) of the Coastal Makran Zone consists of mixed silisiclastic-carbonate deposits, which are known to be shallow marine molasses deposits and comprise mostly material recycled from Makran flyschs and order molasses exposed in the northern highlands. 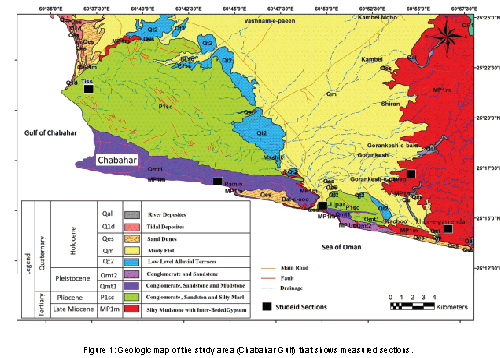 Figure 1: Geologic map of the study area (Chabahar Gulf) that shows measured sections. Samples presented here include mudstones, siltstones and fine-grained sandstones (here termed as mudrocks) collected from the Makran flyschs in view of the fact that fine-grained clastic sedimentary rocks are more useful in geochemical studies than the coarser ones . Mudrocks are fine-grained siliciclastic rocks rich in clay minerals [36,37]. Clays preserve source rock chemical signstures due to the fact their mineralogy is rarely affected during diagenesis and metamorphisis . Fifty-two samples was taken of clastic sedimentary rocks (from Tis, Ramin, Gurankash, Lipar and Khur-e-garrindar sections), and 22 samples were chosen for geochemical analysis. Chemical analyses were carried out at the laboratory of the Geological Survey of Iran. Major elements were analyzed by automatic X-ray fluoreseence spectrometer (XRF) using fusion glasses made from a 1:5 mixture of powdered sample and Li2B4O7 flux . Trace and Rare Earth Elements were analyzed with a Inductively Coupled Plasma Optical Emission Spectrometer (ICP-OES). Loss on ignition was determined by heating the samples at 1000°C for two hours. The analytical reproducibility as deduced from replicate analyses is better than 3.9% for most trace elements and better than 0.9% for most major elements except P2O5 (3.9%), Na2O (1.5%) and K2O (1.3%). The accuracy of the ICP measurements as computed from replicate analysis of the USGS SY-3 rock standard is better than 2% for SiO2, Al2O3, Fe2O3, MnO, CaO, Na2O and TiO2 while the accuracy for P2O5, K2O, and MgO data are 7.4%, 3.5% and 3.7% respectively. The accuracy for most trace element analyses is within 0.54-3.9% (except for V which is 10%) whereas reproducibility of the ICP measurements is better than 7%. 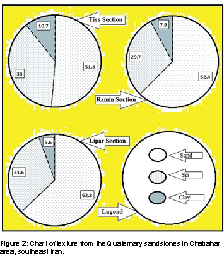 The relative proportions of the sand, silt and clay in the sandstones studied are shown in Figure 2 and plotted on the diagram of Folk (1980) (Figure 3). Most of the samples are texturally classified as silty sand, sandy mud, sandy silt and muddy sand. Figure 2: Chart of texture from the Quaternary sandstones in Chabahar area, southeast Iran. 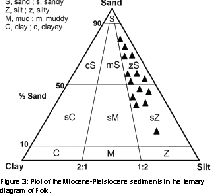 Figure 3: Plot of the Miocene-Pleistocene sediments in the ternary diagram of Folk. Microscopic studies indicate that the Quaternary siliciclastic rocks in the study area are formed mainly of sandstone, greywacke, siltstone and mudstone (Figure 4). Quartz is the dominant detrital mineral; varying from very fine to fine sand-sized grains (Figure 4). The grains range from sub angular to sub rounded and from poorly to moderately sorted. Rocks having well-rounded and sorted grains are present in certain horizons and reflect a more mature depositional setting. Most quartz grains are monocrystalline and some of the quartz grains are partly sutured. In the Pettijohn  scheme, these rocks are classified as litharenite, sub-litharenite and mudstone. The slight enrichment of Na and K-feldspar over plagioclase is attributed either to prolonged weathering, transportation or recycling. 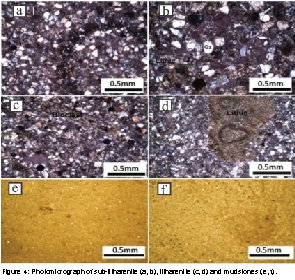 Figure 4: Photomicrograph of sub-litharenite (a, b), litharenite (c, d) and mudstones (e, f). The results of the major and trace element analysis of the mudstones and sandstones of the coastal Makran, Chabahar area (22 samples) are listed in Tables 1 and 2, respectively. Table 2: Chemical composition of Trace elements of the Quaternary sandstones and mudstones, Chabahar area. The Major element distributions reflect the mineralogy of the studied samples. The SiO2 content is low and varies from 53.9% to59.7%, with an average of 56.4%. Silica is below the mean value for the upper continental crust (UCC) in most studied samples . Sandstones are higher in SiO2 content than mudstones (Figure 5). Similarly, mudstones are higher in K2O, Fe2O3 and TiO2 contents than sandstones, which reflect their association with clay-sized phases. Al2O3 abundances were used as a normalization factor to make comparisons among the different lithologies, because of its immobile nature during weathering, diagenesis, and metamorphism. In Figure 5, major oxides are plotted against Al2O3. Average UCC values  are also included for comparison. Among other major elements, Fe2O3, MgO, K2O, TiO2 and P2O5 are consequently showing strong positive correlations with Al2O3, whereas CaO and Na2O do not exhibit a trend (Figure 5). The, strong positive correlations of the major oxides with Al2O3 indicate that they are associated with micaceous/clay minerals. In comparison with UCC, the studied mudstones are low in MgO, CaO, Na2O and high in Al2O3 and TiO2. Al and Ti are easily absorbed by clays and concentrate in the finer, more weathered materials. In addition, XRD analysis of the studied mudstones and sandstones reveals that they are associated with the mineral chlorite (Al2O3) . On average, the studied mudstones have lower SiO2 abundances relative to UCC therefore the observed variations are probably due to quartz dilution effect. Figure 5: Co-variation of major elements versus Al2O3 for the study samples. 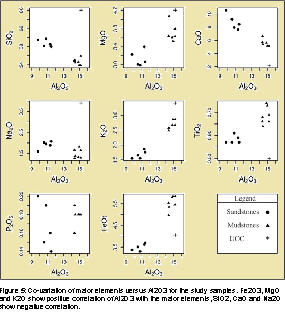 Fe2O3, MgO and K2O show positive correlation of Al2O3 with the major elements, SiO2, CaO and Na2O show negative correlation. Generally, most elements increase with rise in Al2O3 from silty sandstone to sandy mudstone. Positive correlations with Al2O3 are shown by most of the major elements (Figure 5). Marked negative correlation is shown by SiO2 confirming that much of SiO2 is present as quartz grains. These trends may be controlled by the silt fraction . The trend of decreasing K2O and Na2O with increasing SiO2 is sensitive to grain size, probably due to the decrease of clay content in the coarser sediments. The low K2O/Na2O ratios of due to sedimentation processes or the lack of source rocks contain sodium plagioclase [43-45]. A positive correlation between K2O and Al2O3 implies that the concentrations of the K-bearing minerals have significant influence on Al distribution and suggests that the abundance of these elements is primarily controlled by the content of clay minerals [43,46]. However, according to the geochemical classification of , most of the studied mudstones and sandstones samples plot as tight clusters in the wacky field (Figure 6). Only a few samples are enriched in Fe2O3 and fall in the shale and litharenite field. In terms of major element compositions (Table 1), studied sandstones are relatively enriched in MgO, Fe2O3 and Al2O3 and depleted in Na2O and K2O. Mudstones have a higher proportion of Al2O3 and are depleted in Na2O, which reflects the greater proporition of clay minerals (especially chlorite and sericite) in the finer-grained deposits. 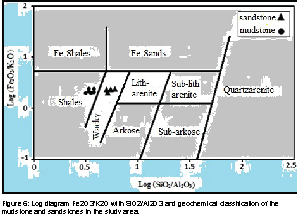 Figure 6: Log diagram Fe2O3/K2O with SiO2/Al2O3 and geochemical classification of the mudstone and sandstones in the study area. The major and trace element compositions for the studied samples (sandstones and mudstones) are highly comparable and are suggestive of similar protolith (Table 1). 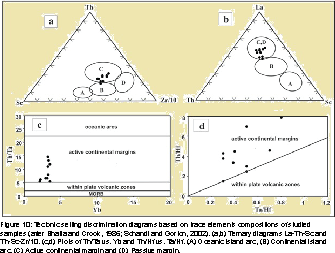 However, the depletion in TiO2, Al2O3 and the transition trace elements particularly Co, Ni, Sc and V, which are normally enriched in mafic rocks . These elements are mainly concentrated in the clays or metal oxides . Vanadium is positively correlated with TiO2 (r = 0.71). It is possibly adsorbed on kaolinite and associated with iron oxide minerals [50,51]. The negative correlation between SiO2 and the trace elements suggests most of the trace elements are concentrated in the clay fraction. Ba is positively correlated with K (r = 0.54), suggesting that the K bearing clay minerals control its abundance [43,52,53]. Positive correlation of Co, Ni, Cu, Zn, Li and V with both Al2O3 (r = 0.91, 0.48, 0.23, 0.36, 0.22 and 0.41, respectively, Figure 7) and Fe2O3 (r = 0.90, 0.35, 0.18, 0.25, 0.28 and 0.13 respectively, Figure 8). Cr is positively correlated with SiO2 (r = 0.40) and negatively correlated with most major and trace elements, suggesting its possible association with calcite. 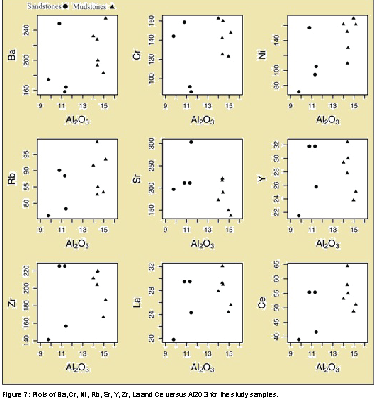 Figure 7: Plots of Ba, Cr, Ni, Rb, Sr, Y, Zr, La and Ce versus Al2O3 for the study samples. 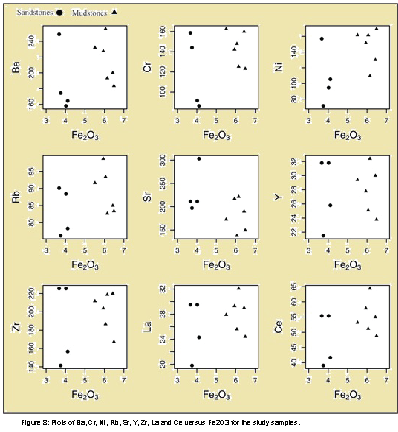 Figure 8: Plots of Ba, Cr, Ni, Rb, Sr, Y, Zr, La and Ce versus Fe2O3 for the study samples. Major elements geochemistry has been employed largely to decipher ancient tectonic setting(Maynard et al., ; Bhatia ; Roser and Korsch, 1985, 1986, 1988; Bhatia and Crook ; Merodio and Spalletti, 1990; Spalletti et al., 1991, 1992).. On SiO2-K2O/Na2O, Al2O3/SiO2-Fe2O3+MgO, TiO2-Fe2O3+MgO, and SiO2/Al2O3-K2O/ Na2O diagrams, the studied samples show a considerable range of compositions (Figure 9). As a result, interpretations of the tectonic setting using these compositions are not straightforward [9,11,54]. Na and K are among the most mobile major elements, and the use of Na2O and K2O to discriminate tectonic settings may be regarded cautioualy. As discussed previously, it should be noted that Fe2O3 likely was enriched during the sedimentary processes and early diagenesis. Several trace elements, such as Cr, Co, Th, Sc, La and Zr, should be immobile under depositional conditions and diagnose specific source rocks [5,10,55]. Hence, thay are more useful in discriminating tectonic environments than the major elements. In the ternary, Th-Sc-Zr/10 and La-Th-Sc plots proposed by Bhatia and Crook  data for the study samples are scattered, but most fall within the active continental margin (ACM) fields (Figure 10). 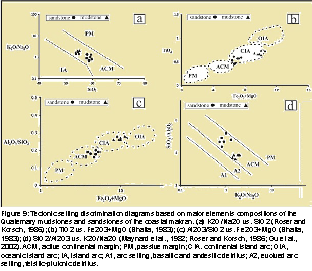 Figure 10: Tectonic setting discrimination diagrams based on trace elements compositions of studied samples (after Bhatia and Crook, 1986; Schandl and Gorton, 2002). (a,b) Ternary diagrams La-Th-Sc and Th-Sc-Zr/10. (c,d) Plots of Th/Ta vs. Yb and Th/Hf vs. Ta/Hf. (A) Oceanic island arc, (B) Continental island arc, (C) Active continental margin and (D) Passive margin. Several ratios and plots may be used to define the source rock of siliciclastic deposites. Presence of greater than 70% SiO2 implies the sandstones are rich in quartz from quartz-rich crystalline provenance. K2O/Na2O ratio can be considered as a simplified chemical provenance indicator . High values of this ratio reflect derivation from granites rather than from basic rocks. This is also confirmed by the clay mineral content, as illite and kaolinite were considered to inherit from weathering horizons and soils developed on silicic rocks. In addition, the absence of chlorite and smectite clay minerals also precludes mafic source rocks. Felsic source rocks usually contain markedly lower concentrations of Cr, Co, Ni and V elements and higher concentrations of Ba and Sr then mafic source rocks. This is reflected in the sediments, indicating the original protolith chemistry [5,43,57]. The studied samples examined here are enriched in Sr and Ba and depleted in transitional elements such as Cr, Co, Ni and V, reflecting the negligible role of mafic provenance . Also, these samples have elevated Ba contents but are depleted in Co. The higher Ba/Co ratio (Table 1) is suggestive of sediments derived from weathered quartzose source. In the discrimination diagram for sedimentary provenance after , all samples of the studied sandstones and mudstones plot in the quartzose sedimentary field (Figure 11). Figure 11: Provenance discriminant function diagram using major elements. However, the Th/U ratios are very useful in determining the source characteristics of clastic sedimentary rocks . 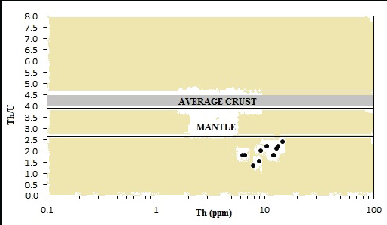 The present average crust the Th/U ratios of 4.25-4.30 whereas the values for upper and lower mantle are 2.6 and 3.8, respectively . Although, sometimes higher Th/U ratios have been related to oxidative weathering and removal of U, yet, clastic sedimentary rocks derived from the upper crust are characterized by ratios equal to or greater than 4 whereas ratios lower than 4 have been related to a mantle contribution . The sandstone and mudstone of Chabahar area, mean Th/U ratios of 1.8-2.4, respectively, which characteristics are suggestive of mantle parentage. The elevated Th/U ratios in the studied samples (sandstone and mudstone) could be attributed to either increased weathering intensity or variation in oxidation state during deposition which would permit U mobility . On the Th/U versus Th diagram, all sandstone and mudstone samples from the Chabahar area, derived from the mantle (Figure 12). Figure 12: Plot of Th/U versus the Th for the sandstone and mudstone of Chabahar area, southeast Iran. The grey box shows the typical range of upper crustal protolithes. The geochemical variations between elements such as Th and La (indicative of a felsic source) and Sc (indicative of a mafic source) have been used to distinguish between felsic and mafic provenances by various outhors . Th/Sc ratios are useful indicators of source rock processes and are unaffected by sedimentary processes . The Th versus Sc plot (Figure 13), adopted from McLennan , reveals two dominant source areas, a continental source with Th/Sc ratios near 1 and intermediate source with Th/Sc ratios 1-0.6 and mafic source with Th/Sc ratios lower 0.6 (see; Figure 14). This observation further suggests that the sandstones and mudstones were formed by more ultrabasic detritus (intermediate source). Figure 13: The versus Sc diagram indicating felsic and mafic provenance for the mudstones and sandstones of Chabahar area. Figure 14: Scatter plot of Al/Na ratios versus Chemical Index of Alteration (CIA) for the studied samples. Fields are from Servaraj and Arthur (2006). Major elements abundances may reflect the composition of source rocks. However, in some cases, their proportions may be modified by weathering processes that affect the source rocks and by post-depositional changes that affect the sediments [61-63]. Chemical weathering affects, to a great extent, the composition of siliciclastic sediments. Through these processes the large cations (Ba and Al) remain preserved in the weathering residue in contrast to the smaller cations (Na, Ca, Sr) that can be selectively removed [44,64]. The SiO2/ Al2O3 ratios are low (3.55-6.09%; averaging 4.41%) and indicate a low degree of maturation of the mudstones and sandstones Chabahar area, southeast Iran (Table 1). 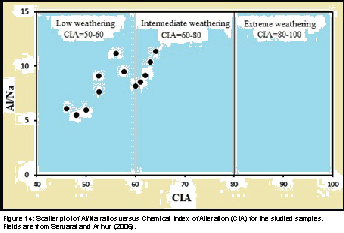 The degree of weathering may assessed by the chemical index of alteration (CIA = [Al2O3 / (Al2O3 + CaO* + Na2O + K2O) × 100]; ) and the plagioclase index of alteration (PIA = [ Al2O3 - K2O / (Al2O3 + CaO* + Na2O + K2O) × 100]; ), in molecular proportions. In the equations, CaO* represents the value of Ca in the silicate fraction only or other term CaO* is the amount of CaO incorporated in the silicate fraction of the rock. CIA and PIA values of about 45-55 imply weak weathering [60,66] whereas values of near 100 indicate intense weathering, with complete removal of the alkali and alkaline earth elements and increasing Al2O3 content. Because feldspar and volcanic glass make more than 75% of the labile material in the upper crust, these indices measure the degree of alteration of feldspar to clay minerals [5,44,66,67]. So, the CIA values represent the alteration of primary minerals (e.g., feldspars, volcanic glass, heavy minerals) to clay minerals. Low CIA values indicate a low to moderate degree of alteration of the source rocks. The calculated CIA and PIA values (Table 1) range from 40 to 60, with an average 54.5, and from 40 to 64 with an average 55.2, respectively. However, most samples have values less than 50, suggesting the low to moderate degree of alteration and weathering either of the original source rocks. In a plot of Al/Na ratios versus CIA of all sandstones and mudstones plot in the intermediate weathering field except for a few samples which plot in the low weathering field (Figure 14). Sandstones and mudstones composition of Chabahar area expressed as a function of SiO2 percentage against total percent of Al2O3, K2O and Na2O is used the discriminate the paleoclimatice signature and to give an idea about the chemical maturity of the studied deposites (Figure 15). The majority of the studied sandstones and mudstones plot in arid field with low maturity. 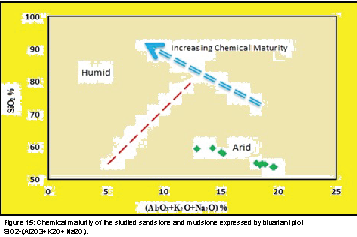 Figure 15: Chemical maturity of the studied sandstone and mudstone expressed by bivariant plot SiO2-(Al2O3+K2O+Na2O). The geochemistry of Quaternarys andstones and mudstones from Chabahar area, southeast Iran, were studied to determine their provenance, source area weathering and the tectonic setting in which they were deposited. Our attempt to distinguish tectonic setting from major element geochemistry is not successful. In this case, mobile elements such as Na and K seem controlled not only by provenance but also by mineralogical transformation and authigenesis, especially during diagenesis. Some trace elements, such as (Cr, Co, Th, Sc, La and Zr) better preserve the characteristics of source rocks because of their low mobility on the earths surface. Source rock weadering and provenance of the sandstones and mudstones sequences in Chabahar area have been assessed using geochemical studies. Major elements compositions suggest that these rocks were derived from low to moderately weathered protoliths. The low CIA and PIA values of these rocks a low to moderate degree of alteration of the source rocks. Discrimination plots by major and trace elements shows that most data lie in field, typical of active continental margin. The Th/Sc, Co/Th, La/ Sc and Cr/Th values point to a significant input of detrital material of intermediate composition. Lee JI, Park B, Jea Y, Yoon HI, Yoo KC (2005) Geochemical characteristics and the Provenance of sediments in the Bransfield Strait, West Antarctica. Marine Geology 219: 81-98. Whitmore CP, Crook KAW, Johnson DP (2004) Grain size control of mineralogy and geochemistry in modern river sediment, New Guinea Collision, Papua New Guinea. Sedimentary Geology 171: 129-157. Von Eynatten H (2004) Statistical modeling of compositional trends in sediments. Sedimentary Geology 172: 251-268. Von Eynatten H (2003) Petrography and chemistry of sandstone from the Swiss Molasse Basin: An archive of the Oligocene to Miocene evolution of the Central Alps. Sedimentology 50: 703-724. Taylor SR, McLennan SM (1985) The Continental Crust: Its Composition and Evolution. Blackwell, Oxford. Crook KAW (1974) Lithostratigraty and geotectonic: The significance of composition variation in flysch arenites (graywackes). Dickinson WR, Suczek CA (1979) A plate tectonic and sandstones compositions. Bull Am Assoc Pet Geol 63: 2164-2182. Dickinson WR, Beard LS, Brakenridge GR, Evjavec JL, Ferguson RC, et al. (1983) Provenance of North American Phanerozoic sandstons in relation to tectonic sitting. J Geol Soc Am Bull 94: 222-235. Bhatia MR (1983) Plate tectonics and geochemical composition of sandstones. J Geol 91: 611-627. Bhatia MR, Crook KAW (1986) Trace element characteristics of greywackes and tectonic setting discrimination of sedimentary basins. Contributions to Mineralogy and Petrology 92: 181-193. Roser BP, Korsch RJ (1986) Determination of tectonic setting of sandstone-mudstone suites using SiO2 content and K2O/Na2O ratio. J Geology 94: 635-650. Roser BP, Korsch RJ (1988) Provenance signatures of sandstone-mudstone suites determined using discriminant function analysis of major-element data. Chemical Geology 67: 119-139. McLennan SM (1989) Rare earth elements in sedimentary rocks: influence of provenance and sedimentary processes. Reviews in Mineralogy and Geochemistry 21: 169-200. Bhatia MR, Taylor SR (1981) Trace element geochemistry and sedimentary provinces: a study from the Tasman Geosyncline, Australia. Chemical Geology 33: 115-126. Bhatia MR (1985) Composition and classification and flysch mudrocks of Eastern Australia: Implications in provenance and tectonic setting interpretation. Sedimentary Geology 41: 249-268. Schvosbo NH (2003) The geochemistry og Lower Paleozoic sediments deposited on the margins of Baltica. Bulletin Geological Society of Denmark 50: 11-27. Amstrong-Altrin JS, Lee YI, Verma SP, Ramasamy S (2004) Geochemistry of sandstones from the Upper Miocene Kudankulam Formation, southern India: Implications for provenance, weathering and tectonic setting. Journal of Sedimentary Research 74: 285-297. Zimmermann U, Bahlburg H (2003) Provenance analysis and tectonic setting of the Ordovician clastic deposits in the southern Puna Basin, NW Argentina. Sedimentology 50: 1079-1104. Condie KC (1993) Chemical composition and evolution of the upper continental crust: contrasting results from surface samples and shales. Chem Geol 104: 1-37. Asiedu DK, Dampare SB, Asmoah Sakyi P, Banoeng-Yakubo B, Osae S, et al. (2004) Geochemistry of Paleoproterozoic metasedimentary rocks from the Birim diamontiferous field, southern Ghana, Implications for provenance and crustal evolution at the Archean-Proterozoic boundary. Geochemical Journal 38: 215-228. Page WD, Alt JN, Cliff LS, Plafker G (1979) Evidence for occurrence of large magnitude earthquakes along the Makran coast of Iran and Pakistan. Tectonophysics 52: 533–547. Platt JP, Leggett JK, Young J, Raza H, Alam S (1985) Large-scale sediment underplating in the Makran accretionary prism, Southwest Pakistan. Geology 13: 507–511. Flueh ER, Kukowski N, Reichert C (1997) RV Sonne, Cruise Report SO123 ‘MAMUT’ (Makran Murray Traverse): GEOMAR Report. Hosseini-Barzi M, Talbot C (2003) A tectonic pulse in the Makran accretionary prism recorded in Iranian coastal sediments. Journal of the Geological Society 160: 903–910. Kukowski N, Schillhorn T, Huhn K, von Rad U, Husen S, et al. (2001) Morphotectonics and mechanics of the central Makran accretionary wedge off Pakistan. Marine Geology 173: 1–19. Grando G, McClay K (2007) Morphotectonics domains and structural styles in the Makran accretionary prism, offshore Iran. Sedimentary Geology 196: 157–179. Ellouz-Zimmermann N, Deville E, Muller C, Lallemant SJ, Subhani AB, et al. (2007a) Impact of sedimentation on convergent margin tectonics: example of the Makran accretionary prism. Frontiers in Earth Sciences pp. 327-350. DeMets C, Gordon RG, Angus DF, Stein S (1994) Effect of recent revisions to the geomagnetic reversal time scale on estimates of current plate motions. Geophysical Research Letters 2: 2191–2194. Ellouz-Zimmermann N, Lallemant S, Castilla R, Mouchot N, Leturmy P, et al. (2007b) Offshore frontal part of the Makran Accretionary prism: the Chamak Survey (Pakistan), thrust belts and foreland basins pp. 351–366. Quittmeyer RC (1979) Seismicity variations in the Makran region of Pakistan and Iran: relation to great earthquakes. Pure and Applied Geophysics 117: 1212–1228. Ambraseys N, Bilham R (2003) Earthquakes and associated deformation in Northern Baluchistan 1892–2001. Bulletin of the Seismological Society of America 93: 1573–1605. Byrne DE, Sykes LR, Davis DM (1992) Great thrust earthquakes and aseismic slip along the plate boundary of the Makran subduction zone. Journal of Geophysical Research 97: 449–478. Ambraseys NN, Melville CP (1982) A History of Persian Earthquakes. Cambridge University Press, Britain. Bilham R, Lodi S, Hough S, Bukhary S, Khan AM, et al. (2007) Seismic hazard in Karachi, Pakistan: uncertain past, uncertain future. Seismological Research Letters 78: 601–613. Heidarzadeh M, Pirooz M, Zaker N, Yalciner A (2009) Preliminary estimation of the tsunami hazards associated with the Makran subduction zone at the northwestern Indian Ocean. Natural Hazards 48: 229-243. Farhoudi G, Kareg DE (1977) Makran of Iran and Pakistan as an active are system. Geology 5: 664-668. Yong IL (2002) Provenance derived from the geochemistry of late Palaeozoic-eaely Mesozoic mudrock of the Pyeongan Supergroup, Korea. Sediment Geol 149: 219-235. Weaver CE (1989) Clays, muds and shales. Developments in Sedimentology 44: 819. Sugisaki R, Shimomura T, Ando K (1977) An automatic X-ray fluorescence method for the analysis of silicate rocks. J Geol Soc Jpn 83: 725-733. Pettijohn FJ, Potter PE, Siever R (1987) Sand and sandstones. Springer-Verlag, New York. Afarin M (2012) Geochemistry and mineralogy of Miocene marls in coastal zone of Chabahar, Makran, Southeast of Iran. M.Sc. Thesis, Islamic Azad University of Zahedan, Iran, 112 pp. (in Persian with English abstract). Roser BP, Cooper RA, Nathan S, Tulloch AJ (1996) Reconnaisance sandstone geochemistry, provenance and tectonic setting of the lower Paleozoic terranes of the West Coast and Nelson, New Zealand. N.Z.J. Geol Geophys 39: 1-16. McLennan SM, Taylor SR, Eriksson KA (1983) Geochemistry of Archean shales from the Pilbara Supergroup, Western Australia. Geochim Cosmochim Acta 47: 1211-1222. Nath BN, Kunzendorf H, Pluger WL (2000) Influence of provenance, weathering and sedimentary processes on the elemental ratio of the fine-grained fraction of the bed load sediments from the Vembanad Lake and the adjoining continental shelf, southwest Coast of India. J Sed Res 70: 1081-1094. Osae S, Asiedu DK, Yakubo B, Koebrel C, Dampare SB (2006) Provenance and tectonic setting of Late Proterozoic Buem sandstones of southeastern Ghana: Evidence from geochemistry and detrital modes. J Afri Earth Sci 44: 85-96. Jin Z, Li F, Cao J, Wang S, Yu J (2006) Geochemistry of Daihai Lake sediments, Inner Mongolia, north China: Implications for provenance, sedimentary sorting and catchment weathering. Geomorphology 80: 147-163. Herron MM (1988) Geochemical classification of terrigenous sands and shales from core or log data. Journal Sed Petrology 58: 820-829. Rollinson HR (1993) Using Geochemical Data: Evoluation, Presentation, Interpretation. Turekian KK, Carr MH (1960) The geochemistries of chromium, cobalt and nickel. Inter Geol Cong Norden Part 1: 14-27. Hirst DM (1962) The geochemistry of modern sediments from the Gulf of Paria. II. The location and distribution of trace elements. Geochim Cosmochim Acta 26: 1147-1187. Abdel Wahab H, Yemane K, Giegengack R (1997) Mineralogy ang geochemistry of the Pleistocene lacustrine beds in Wadi Feiran, south Sinai, Egypt: Implication for environmental and climate changes, Egypt. J Geol 41: 145-171. Cullers RL (1995) The controls on the major and trace element evolution of shales, siltstone and sandstone of Ordovician to Tertiary age in the Wet Mountains region, Colorado, USA. Chemical Geology 123: 107-131. Holail HM, Moghazi AM (1998) Provenance, tectonic setting and geochemistry of graywackes and siltstones of the late Precambrian Hammamat Group, Egypt. Sed Geol 116: 227-250. Maynard JB, Valloni R, Yu HS (1982) Composition of modern deep-sea sands from arc related basins. Trench-Forearc Geology: Sedimentation and tectonics on modern and ancient active plate margin, 10. Geol Soc London Spec Pub pp. 551-651. Roser BP, Korsch RJ (1985) Plate tectonics and geochemical composition of sandstones: a discussion. Journal of Geology 93: 81-84. Potter PE (1978) Petrology and chemistry of modern big river sands. J Geology 86: 423-449. Wronkiewicz DJ, Condie KC (1990) Geochemistry and mineralogy of sediments from the Ventersdrop and Transvaal Supergroup, South Africa: Cratonic evolution during the early Proterozoic. Geochim Cosmochim Acta 54: 343-354. Roddazi M, Viers J, Brusset S, Baby P, Boucayrand C, et al. (2006) Controls on weathering and provenance in the Amazonian foreland basin: insights from major and trace element geochemistry of Neogene Amazonian sediments. Chem Geol 226: 31-65. Paul D, White WM, Turcotte DL (2003) Constraints on the 232Th/238U ratio (k) of the continental crust. Geochem Geophys Geosyst 4: 1102. McLennan SM, Hemming S, McDaniel DK, Hanson GN (1993) Geochemical approaches to sedimentation, provenance and tectonics. Geol Soc Am Special Paper 284: 21-40. Boles JR, Franks SG (1979) Clay diagenesis in Wilcox Sandstones of southwest Texas: Implication of smectite diagenesis on sandstone sementation. Journal of Sedimentary Petrology 49: 55-70. Nesbitt HW, Young GM, McLennan SM, Keays RR (1996) Effects of chemical weathering and sorting on the petrogenesis of siliciclastic sediments, with implication for provenance studies. J Geol 104: 525-542. 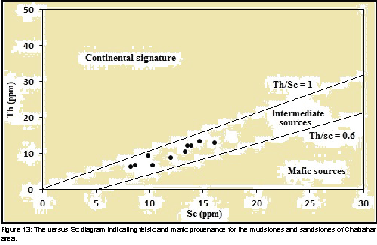 McLennan SM (2001) Relationships between the trace element composition of sedimentary rocks and upper continental crust. Geochemistry Geophysics Geosystems. Fedo CM, Eriksson KA, Krogstad EJ (1996) Geochemistry of shales from the Archean Buhawa Greenstone Belt, Zimbabwe: implication for provenance and source-area weathering. Geochim Cosmochim Acta 60: 1751-1763. Nesbitt HW, Young GM (1982) Early Proterozoic climates and plate motins inferred from major element chemistry of lutites. Nature 299: 715-717. Fedo CM, Nesbitt HW, Young GM (1995) Unraveling the effects of potassium metasomatism in sedimentary rocks and paleosols, with implications for paleoweathering conditions and provenance. J Geology 23: 921-924. Nesbitt HW, Young GM (1984) Prediction of some weathering trends of plutonic and volcanic rock based upon thermodynamic and kinetic consideration. Geochim Cosmochim Acta 48: 1523-1534.